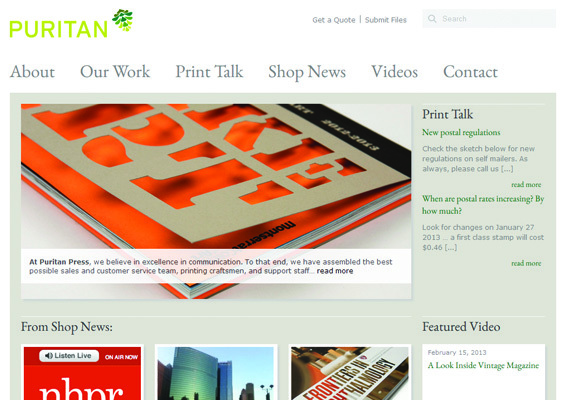 description: Puritan Press is a New Hampshire based printing company. I worked on their website during my time at Sametz Blackstone Associates as a Digital Media Developer. With a small team including myself, a designer, and relationship manager, we worked with the client to identify how best to meet their functionality requirements while complying with their budgetary needs. We took them from a static site to an open source content management system with an easy to maintain back end. This allowed the client to easily update the various sections of their site, which included several graphical galleries, text-based articles, and submission forms. I was responsible for all coding, implementation, and technical training for the client. The site was completed in late 2011.